THE first replacement unit for Northern Rail ‘Pacers’ – two-car Class 195 No. 195001 – arrived in the UK on June 25. The set is the first of 25 two- and 30 three-car trains ordered by Northern and being built by CAF in Spain on its ‘Civity’ platform. A driving car from new CAF DMU No. 195001 arrives at Portbury Dock. Picture courtesy of Northern. Bodyshells are fabricated in Zaragoza, with final assembly at Irun. The first set was imported via Portbury Docks and taken by road to Merseyside. 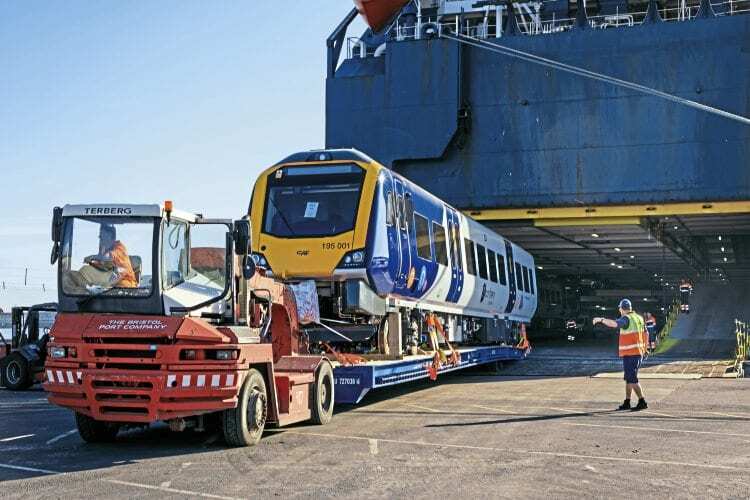 It is currently at Edge Hill depot receiving the finishing touches, before entering the dynamic testing and certification modes, followed by a driver training programme.